Pruning trees and shrubs is one of the most frequently misunderstood aspects of gardening. Questions abound… How much should I prune? Which branches should I prune? Should I paint over my cuts? Should I apply a commercial sealant? And there is a lot of misinformation out there. 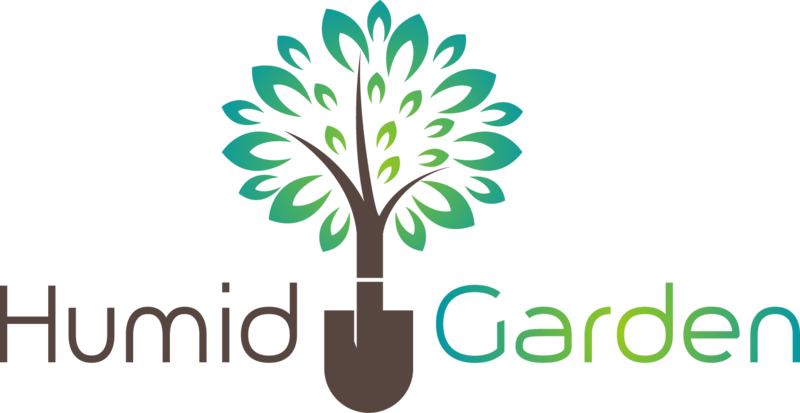 Many people are so intimidated by the ins and outs of pruning that they avoid the task entirely, or just pay someone else to do it for them. But it doesn’t need to be so complicated. Follow a few simple guidelines, and make sure that you have the best pruning saw for the job. With a little research, you can handle this task on your own with only a few simple hand tools. And with practice, you can even ﻿﻿become an arbo﻿﻿rist﻿ if you want to. 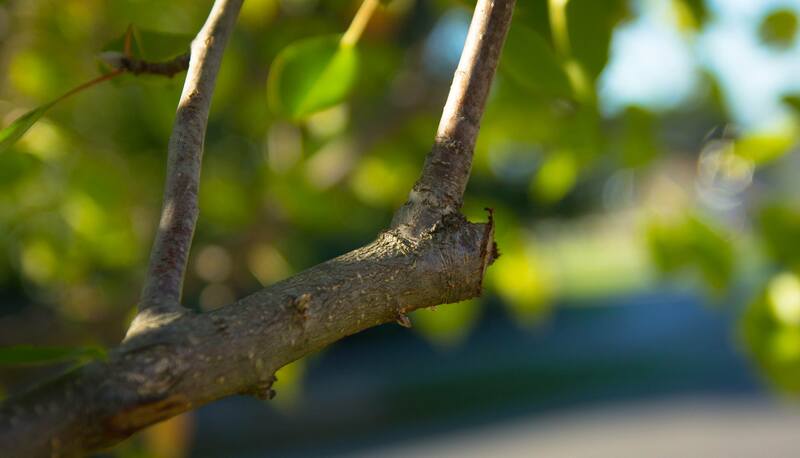 Why Prune Your Trees and Shrubs? How Much Should You Prune? 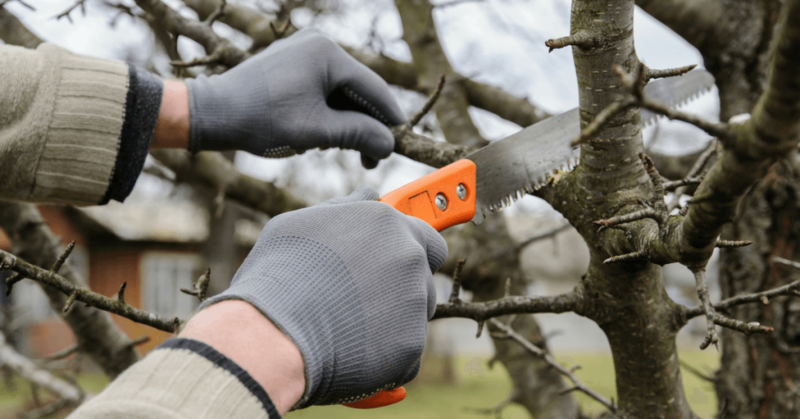 Which Pruning Saw is Best for You? Why should you prune a tree? Think about the other plants in your garden. What would you do if you noticed that a cane on your favorite rose bush had been snapped in half and was barely hanging on? You would get your loppers and cut it off. What would you do if you noticed that a stalk on one of your Gerber daisies had been broken in half by a passing animal? You would get your pruning shears and cut the broken stalk off. Your trees are no different than these other garden favorites… just much larger. When a tree limb has been injured, the best thing to do is cut it off, replacing the jagged break with a clean cut. Any branches that have contracted a disease or been damaged by a storm should be treated the same way. 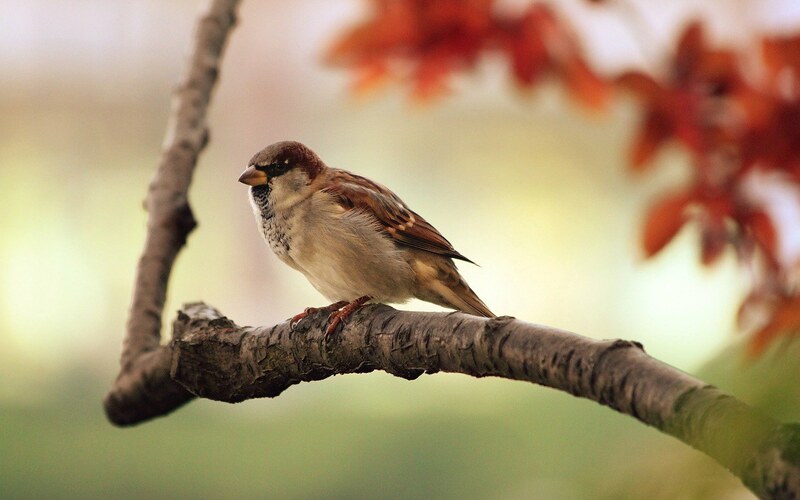 Another major reason to prune a tree is to increase sun penetration and air circulation. When a tree’s crown is very full, it can create a dark and still environment with limited sun and air circulation. This is the type of environment where fungus and insects can and will flourish. By pruning you can open up a tree canopy to allow sun and light in. Other common reasons for pruning a tree are to increase flowering on an ornamental tree or to increase fruiting on apple trees or other orchard trees. These are special cases, and you should research the individual species that you have to determine the best approach. The most frequent questions about pruning are when to do it and how much should be pruned. Here is a quick overview to answer both of those questions. Generally speaking, the best time to prune any shrub or tree is during the dormant season when the tree is not in an active growth cycle. Many experts agree that the best time for optional pruning is very late winter, after the worst cold of winter has passed. Pruning to remove dead or damaged wood can be done anytime. The only time when you should avoid pruning is during the fall. Fungus spreads profusely during the fall, making this a risky time to expose new wounds on your trees and shrubs. You should prune as little as possible. Only cut away branches and limbs for which you have a clear reason for removing them. Start with dead and damaged limbs – cut all of these. Next, identify areas where growth is extremely dense. Selectively cut away some branches to open the canopy in these spots. Finally, make any optional cuts to improve the shape and appearance of the tree. If you only make cuts that meet one of these 3 criteria, you will have done your tree a service. If you cut away too much wood, or cut any of the tree’s most major branches – you risk doing harm. Many people ask whether they should paint over fresh cuts on a tree or shrub. No. The currently accepted best practice is not to paint over wounds. Doing so can actually cause harm to the tree. If you need to protect the cut from some specific parasite or disease – cloth dressings are a better choice. The best way to ensure a clean cut without spreading diseases between trees is to thoroughly clean and disinfect your pruning saws. Only work on one tree at a time, and clean your tools before moving on to the next tree. There are many different tools that are commonly used in tree pruning. The factors that determine the best tool for the job include the size, height, location, and angle of the branch to be cut. Loppers are an option for small branches and twigs. And chainsaws are necessary for especially large branches. 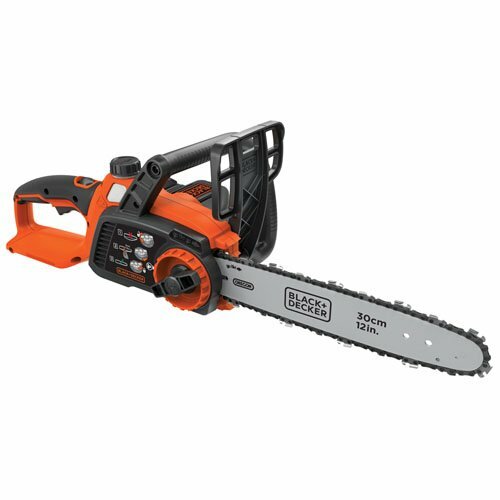 There is a wide array of power saws available for working on trees and shrubs. The most common, of course, is the chainsaw. This is an exceptionally dangerous tool. If you are not comfortable handling a chainsaw, never operate one. Leave this task for someone who is more experienced. The only thing more dangerous than a chainsaw is an extension saw – which is basically a chainsaw on the end of a 10-foot pole. These are excellent tools for pruning large trees. But their use requires care, confidence, and experience. If you’re not positive about it, skip it, and leave this tool for the professionals. Pole saws are much like hand-held pruning saws, except that the saw blade is located at the end of a long pole. Pole saws are a safe and acceptable alternative to extension chain saws – anyone can operate a pole saw safely. The major drawback is time. You can make the same cuts with a pole saw that you would make with an extension saw – but those cuts will take a much longer time. 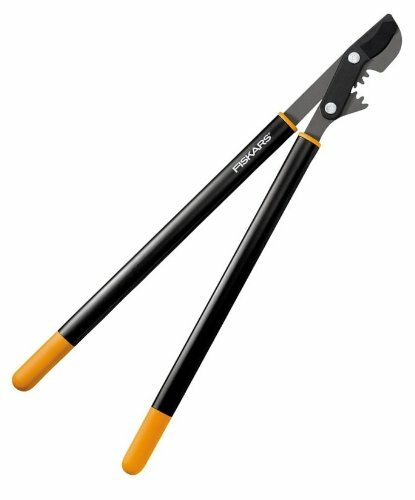 Loppers are a good option for very small branches and twigs. Bypass loppers are the standard design, and can handle branches up to about an inch in diameter. Some ratcheting loppers claim to be able to handle branches up to 2 inches. Hand saws ﻿﻿﻿﻿are the most basic, and irreplaceable pruning saws. A good pruning saw like this can take care of 90% of the pruning that the average homeowner needs to do. A good rule of thumb to follow is that if a branch is smaller than your thumb, you can use pruners. If a branch is bigger than your thumb, you should get your pruning saw. Hand pruning saws are the most versatile and widely used pruning tools. And all of the 5 pruning saws I’m going to review below fall into this category. When you start shopping for a new pruning saw, there are a few factors that you would be wise to take into consideration. What materials are used in the saw’s construction? Does it fold away for safe storage? Is the saw warrantied by the manufacturer against defects in material or labor? For the ﻿﻿blad﻿﻿e, steel is the material of choice, and you should avoid anything else. Most of today’s handles are made from various plastics and rubbers – which offer a sturdier grip and longer lifespan than wood. Most hand-held pruning saws weigh less than a pound. But every ounce counts when you’re making cuts with one hand. Be sure to choose a tool that will be easy for you to handle with one hand and comfortable for you to use in a continuous back-and-forth cutting motion. Smaller saw blades are convenient for squeezing into tight areas. Longer blades allow you to extend your reach high overhead or deep into thick shrubs. Think about the types of cuts you will need to make, and choose a saw with an appropriate blade length to make the job as easy as possible. Consider the teeth-per-inch on the blade you buy. A blade with fewer, larger teeth will allow you to cut through branches more quickly, but will generally result in a rougher cut. Some saws use a special design with multiple cutting edges to make the job even faster. A blade with a greater number of smaller teeth will make a very clean cut although it will take more time. Choose a saw to match the work you intend to do. When properly operated, a pruning saw should last for many years without incident. However, accidents do happen and sometimes there can be deficiencies in the materials that are used. If you choose to invest in high-quality saw, be sure to select one that includes a warranty for defects in materials and assembly. Some pruning saws fold over into their handles for safe carrying and storage. Others remain extended with their teeth exposed at all times. If you have children, you would be better off to select a saw that folds over to hide its teeth. All of the saws reviewed below are folding saws. The Silky BIGBOY is the longest blade on this list at 14.2 inches. 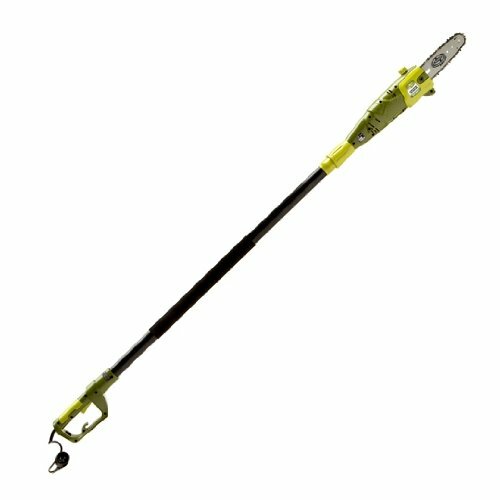 This feature greatly extends your reach to cut branches high overhead or deep inside dense growth. As you would expect, it is also the heaviest saw on the list – weighing in at a solid one pound even. The chrome-plated steel blade has 5.5 teeth per inch, which is fairly large, and helps this saw to cut through large limbs quickly and easily. This saw comes with a limited lifetime warranty against defects in materials and workmanship. The Bahco Laplander is a high-quality pruning saw with a standard 9-inch blade. The steel blade has a special coating to protect against rust and provide exceptionally low friction while cutting. This saw is great for dead wood and green wood. The 7 tooth-per-inch design gives you a fine cut without ripping away chunks of the branch you are cutting. And for added safety, the blade locks shut in both folded and extended positions. The Corona RS 10-inch model gives you an unusually fast cut from a name that gardeners know and trust. Each tooth on this blade is whetstone-sharpened with 3 angles to make cutting as fast and easy as possible. The 10-inch steel blade is curved to further speed the cutting process, and it’s great for dead, hardened, and frozen branches. The razor tooth design is unique to Corona’s saws, and truly does make it the fastest pruning saw on the market today. And, this tool comes backed by Corona’s infamous lifetime warranty. EverSaw’s design features a rugged carbon steel blade with a one-piece rubber handle. This saw uses a Japanese design to reduce friction and give the saw extra power when pulling. The triple-cut razor teeth (9 per inch) are hardened so that the blade stays sharp longer. And a gear-style lock allows you to lock the blade in place at various positions for difficult and hard-to-reach cuts. SHVIRO’s folding hand saw is a great bargain. This is a no-frills option that will last for many years, and it is the least expensive saw on this list. The high carbon steel blade is 7 inches long, with heat-treated teeth. This tool is exceptionally light at only 6.2 ounces – making it easy for anyone to handle and great for outdoor activities like camping and backpacking. SHVIRO does not provide any specific warranty terms, however they do offer a 100% risk-free guarantee – if you don’t like it, you can return it with no questions asked. If you don’t mind the extra size and weight, the Silky saw is a professional-quality tool that will give you years of easy and care-free use. This saw lets you reach higher and further than you can with any other saw on this list. And, using the saw is a pleasure if you can easily handle a tool that weighs a pound. If you want the fastest cuts in a no-frills design, the Corona is the tool for you. Their 3-edge design is infamous for its speed, and really makes cutting a breeze – even on bigger limbs and branches. Whichever saw you select, be sure to take good care of it. An annual cleaning, sharpening, and oiling will make your investment last for as long as possible. Do you have experience using one of these pruning saws? Or do you have a favorite saw that isn’t included on this list? If so, use the comments section below to share your story with us.